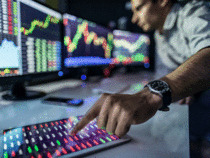 Nifty futures on the Singapore Exchange were trading 34.50 points, or 0.29 per cent, lower at 11,642, indicating a negative start for Dalal Street. Nifty50 ended Thursday’s lacklustre trade a tad below the 11,600 level. In intra-day trade every selling got bought into, as the index recovered from its 20-day moving average to end up forming a neutral Doji candle on the daily chart. Analysts said the index has been trading in the 11,700-11,550 range for last six days, and breakout could give further direction to Nifty50. Asian shares were flat and US Treasury yields pulled back on Friday as investor caution prevailed ahead of the release of first-quarter corporate earnings, although stronger US economic data helped offset some concerns about global growth. Early in the trading day, MSCI’s broadest index of Asia-Pacific shares outside Japan was barely higher, up 0.03 per cent. Japan’s Nikkei stock index gained 0.1 per cent. The Dow Jones Industrial Average index rose 6.58 points, or 0.03 per cent, to 26,157.16, the S&P500 index gained 10.01 points, or 0.35 per cent, to 2,888.21, and the Nasdaq Composite added 54.97 points, or 0.69 per cent, to 7,964.24. Foreign portfolio investors (FPIs) bought Rs 467 crore worth of domestic stocks on Thursday, data available with NSE suggested. DIIs were net sellers to the tune of Rs 16.58 crore, data suggested. Rupee up: The Indian rupee Thursday climbed 19 paise to close at 68.92 against the US dollar, also marking a third straight session of gains, driven by sustained foreign fund inflows. 10-yr bond yields: India 10-year bonds’ yields remained at 7.37% on Thursday, according to RBI data. Call rate: The overnight call money rate weighted average was 5.99% on Thursday, according to RBI data. It moved in a range of 4.60-6.06%. Oil prices were firm on Friday, supported by ongoing supply cuts led by producer club OPEC and by US sanctions on petroleum exporters Iran and Venezuela. International Brent crude oil futures were at $71.01 per barrel, up 18 cents, or 0.3 per cent, from their last close. After 108 economists and former RBI Governor Raghuram Rajan, International Monetary Fund’s (IMF) Chief Economist Gita Gopinath has expressed doubt over India’s growth rate, saying that there are still some issues with the way India calculates it. While she welcomed the changes made to the GDP calculation in 2015, including the change in base year, she also flagged concerns over the “deflator” used to calculate the real GDP. Japan’s Economy Minister Toshimitsu Motegi said on Friday Japan and the United States will hold a first round of trade talks on April 15-16 in Washington, to find ways to address US concerns over the large surplus Japan enjoys in bilateral trade. US President Donald Trump has made clear he is unhappy with Japan’s $69 billion trade surplus with the United States – and wants a two-way agreement to address it. The Reserve Bank of India injected a total liquidity of Rs 2.98 lakh crore in the market in 2018-19, one of its reports said on Thursday. From a daily net average surplus of Rs 27,928 crore during February 1-6, 2019, systemic liquidity moved into deficit during February 7-March 31, reflecting the build-up of government cash balances, the First Bi-monthly Monetary Policy Statement, 2019-20 stated. The average growth rate for daily groceries as well as discretionary items such as cars and two-wheelers were lower under the NDA government compared with the second term of the Congress-led UPA while large electronic goods including televisions, washing machines and refrigerators, on the contrary, logged faster growth. Large electronic products posted higher growth since 2014, revealed data from UK-based researcher Euromonitor International.